A new crossing will be installed at a busy junction in Peterborough city centre. The new light controlled toucan crossing will be installed where the Embankment footway and cycleway cross Bishop’s Road adjacent to the Mitchell Close junction. Works will start from Monday (13 Nov) and are expected to continue for approximately four weeks. 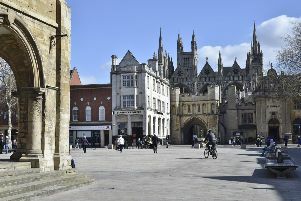 They will be completed by Peterborough City Council’s service provider Skanska and its sub-contractor PGR Construction. Cllr Peter Hiller, cabinet member for growth, planning, housing and economic development at the city council, said: “The existing narrowing feature was installed in the 1990s. “Although it has no doubt been successful in helping to enforce the weight restrictions on this section of Bishop’s Road, it has led to high levels of congestion at peak times and significant queues of traffic, particularly across the Star Road junction. “We now feel the time is right to replace this feature with an alternative that is better suited to our current traffic levels. The weight restriction itself will remain in place. The cost of the works is £175,000 which will be funded through the city council’s integrated transport capital works programme.